South Africa's Offshore Gas Strike - It's All Good, Right? Is Nigeria Losing Competitive Edge as African Oil Producer? Africa's Rich Oil - From Blessing to a Curse of Rampant Corruption and Bad Governance On the Continent? 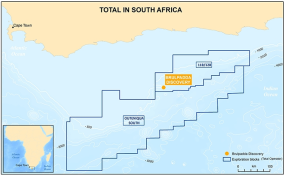 South Africa's business press, taking its cue from President Cyril Ramaphosa, is treating the discovery of natural gas off the Southern Cape coast like it's sunk a 70-foot putt for birdie. But the economic realities of climate change, added to the ingrained truths of the resource curse, suggest that lightning is about to blast the course. Do we play on or run for cover? "Six months ago, I would not have taken people like you," said our driver, when we were negotiating the return trip from Port Harcourt to Yenagoa. "Now, it is fine."